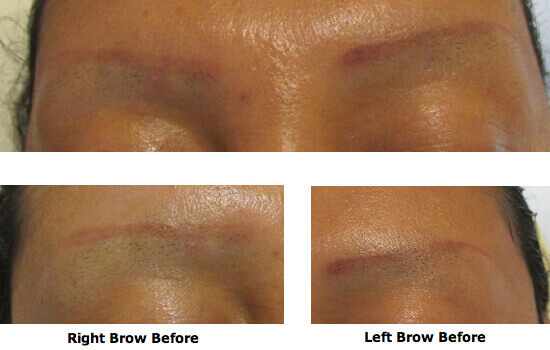 Permanent Eyebrow Makeup will enhance the look of your face. Have you waxed, tweezed, or shaved your brows and think they won’t come back? I have helped sooooo many women who have come to me and are sure their brows won’t grow back. Also see Trichotillomania (hair picking) in When NOT to Tattoo. Click on left side of page. Time after time the brows do grow if you just give them a chance. I will get you through the in-between stages with proper eyebrow shaping, as they grow. You will be able to fill in the brow, as you will now have a shape to follow. This makes the growing in period much more tolerable. There is nothing better than having your own brows and permanent freedom. You can do it! Sometimes the entire brow does not grow back. Then we can tattoo only what you need. 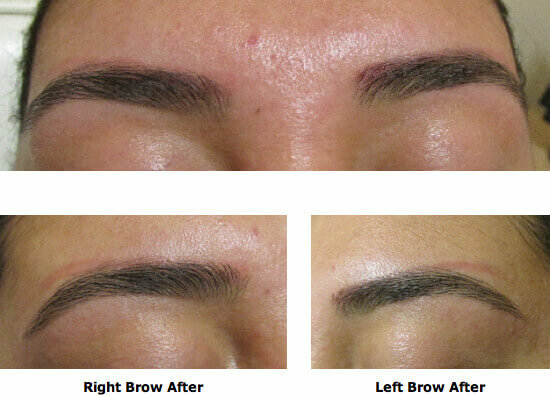 Proper eyebrow shaping will frame your eyes and lend expression to your whole face. We are looking for the drama from two feet or more. 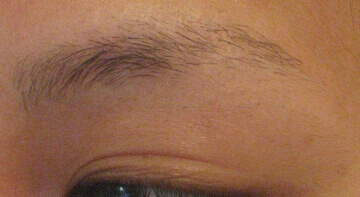 For eyebrow shaping to be effective, you need to give your brows time to grow again. Approximately 2-3 months. Some people grow faster or slower. 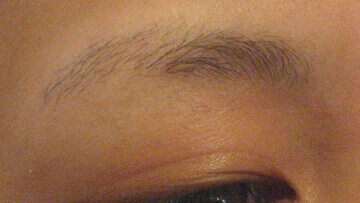 Be patient and put your tweezers away. Find another hobby. Eyebrow shaping needs an artistic eye. The brow shape is done for your particular features. Each hair that is close to the perimeter of the brow contributes to the overall shape and must be considered before it is taken. I personally prefer to tweeze the brow vs. waxing so I don't take important hairs. It takes a little longer, but it is worth it. Before and after pictures reveal small details that we don't always see with the naked eye. Don't take gray hairs! There are ways to tackle that. There are also hair growth products on the market than can help stimulate growth. Always read the fine print before you use anything. The brow hair was colored to reveal the hair. I showed her how to color the brow hair and she was happy not to tattoo. Brows have been over tweezed and cut too short. Brows trimmed underneath. She now has her own full brow. I showed her how to fill the brow in with color if she wants more drama. Brows were tattooed in the wrong place and are misshaped. She never needed tattooing. Brows are growing in and she camouflages the existing tattoo. I trimmed brow growth. She can now begin to draw in the new brow and still camouflage the old tattoo. I drew in the brow to show her the potential if the brow grows in. More growth. I shaped the brow. At this point she could wear them just this way and still camouflage the old tattoo. I showed her how to draw in the brow for a more dramatic appearance. She has the option of trying to remove the old tattoo, but it is fading and she prefers to cover it. She has learned to shape her own brows. If you can't do that, then see me or a professional to help you maintain your new brows. It took patience on her part and the desire to have her permanent freedom back. She came to me requesting tattooing. I encouraged her to let her brows grow. Brows have completely grown in. This took one month. She Has Opted Not to Do Any Tattooing. Brows completely over-tweezed. 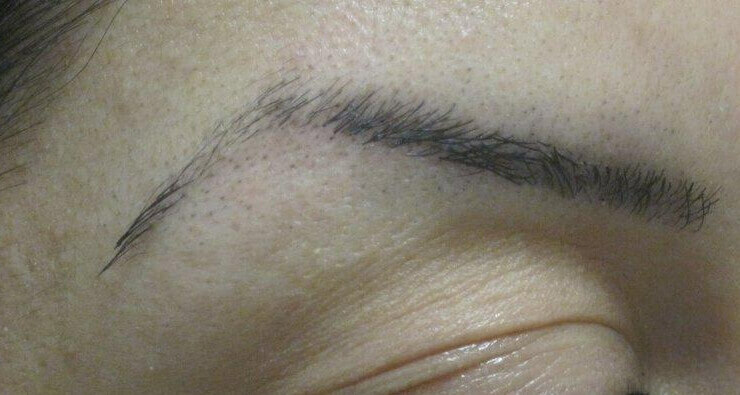 "N" had her brows tattooed and now wanted her own brows back again. "N" contacted me through the Internet from my website to see how she could go about re-growing her brows and how to shape them. I marked the hairs to take, sent back the pictures to her, and we did this a few times all via the Internet. Because she had the patience, "N" was able to follow my instructions. The pictures below show one of the growing in stages and then the final result. Final result. "N" did it and is so rewarded. Fortunately, the brow hair came in over the old tattoo. She is now able to maintain her own brows. There is nothing better than your own brow. Congratulations "N" You did it!! As you can see she had been tattooed where you see the red. You can also see some potential brow growth. She came in just wanting to remove the tattoo. Because I could see that hairs would come in over alot of the tattoo I suggested that we wait to do removal until the brow grew in. I got her through the growing in stages and now she has a beautiful full brow. We are not going to attempt removal at this point because in person the red is very faded and can easily be covered up with a little makeup. She is extremely happy with the result as is her husband.